This venue presents a varied programme of classical music. 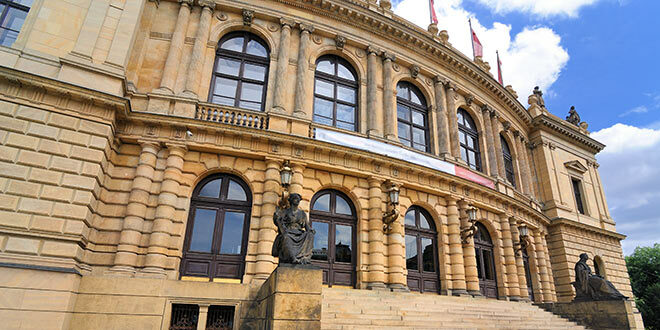 Rudolfinum, built between 1876 and 1884, is an outstanding example of the Czech neo-renaissance style. Between the wars the building was used as the parliament, but today it is used for its original purpose – hosting art exhibitions, and various concert programmes and festivals all year round, including the Prague Proms and the International Festival of Classical Music. Regular concerts are played here by the Czech Philharmonic Orchestra which has its domicile here. The big hall is called the Dvorak Hall and is used for major recitals. The small hall is called the Suk Hall and is used for soloist vocals and instrumentals. The grandeur of the interior, the building as a whole and the high standard of the concerts themselves all make an evening here worthwhile. Box office: 10am-12.30pm and 1.30-6pm. I am bringing a chamber choir of twenty singers to stay in Prague next year April 23 -26. We are looking for concert venues and would very much appreciate it if you could recomend suitable venues for a short programme of a cappella music.